A number of states and polities formerly claimed colonies and territories in Canada prior to the evolution of the current provinces and territories under the federal system. North America prior to colonization was occupied by a variety of indigenous groups consisting of band societies typical of the sparsely populated North, to loose confederacies made up of numerous hunting bands from a variety of ethnic groups (Plains region), to more structured confederacies of sedentary farming villages (Great Lakes region), to stratified hereditary structures centred on a fishing economy (Plateau and Pacific Coast regions). The colonization of Canada by Europeans began in the 10th century, when Norsemen explored and, ultimately unsuccessfully, attempted to settle areas of the northeastern fringes of North America. Early permanent European settlements in what is now Canada included the late 16th and 17th century French colonies of Acadia and Canada (New France), the English colonies of Newfoundland (island) and Rupert's Land, the Scottish colonies of Nova Scotia and Port Royal. France lost nearly all of its colonies in North America in 1763 after the Seven Years' War to the British Empire. Britain's imperial government over a century later then ceded the land to Canadian control in 1867 after confederation. Since then, Canada's external borders have changed several times, and had grown from four initial provinces to ten provinces and three territories by 1999. Indigenous peoples in what is now Canada did not form state societies, and in the absence of state structures, academics usually classify indigenous people by their traditional "lifeway" (or primary economic activity) and ecological/climactic region into "culture areas", or by their language families. The Mi'kmaq in today's Maritimes were governed as seven separate "districts" with their own district chiefs and councils coordinated by the Grand Council meeting yearly on Cape Breton Island. Following their first conflict with the British invaders (King Philip's War) in 1677, the Mi'kmaq joined the wider Wabanaki Confederacy, an alliance with four other Algonquian-language nations: the Abenaki, Penobscot, Passamaquoddy, and Maliseet. To the west around the Great Lakes Council of Three Fires was formed in 796 CE according to oral history, between the Ojibwa, Odawa and the Potawatomi. The five (later six) tribes of the Iroquois Confederacy, was united in 1142 CE according to their oral traditions. There was also the four or possibly five tribes of the Huron Confederacy, both in the Great Lakes region. The Blackfoot Confederacy in present-day Alberta and neighbouring Montana originally consisted of three dialect groups of the same language (Peigan, Kainai, and Siksika [they can each be called "tribes"> but the Blackfoot as a whole are also referred to as a "tribe" reflecting the inconsistent usage of that term]) but they were later joined the completely unrelated Sarcee people. The Iron Confederacy of present-day Alberta and Saskatchewan consisted of numerous bands of mixed Plains Cree, Assiniboine, and Saulteaux people. The Indigenous peoples of the Pacific Northwest Coast and peoples of the Northwest Plateau developed highly structured cultures from relatively dense populations. Some cultures in this region were very similar and share certain elements, such as the importance of fishing to their communities. While the Norse colonies in Greenland lasted for almost 500 years, the continental North American settlements were small and did not develop into permanent colonies. Vinland – Markland – Helluland are the names given to three lands possibly in Canada, discovered by Norsemen as described in the Eiríks saga rauða and Grœnlendinga saga. Based on the Treaty of Tordesillas the Portuguese Crown claimed it had territorial rights in the Atlantic waters visited by explorer John Cabot in 1497 and 1498. In 1498 to 1500, the Portuguese mariner João Fernandes Lavrador visited the north Atlantic coast, accounting for the appearance of the name "Labrador" on topographical maps of the period. In 1501 and 1502 Miguel and Gaspar Corte-Real explored present day Newfoundland claiming the land in the name of Portuguese Empire. The extent and nature of Portuguese activity on the Canadian mainland during the 16th century remains unclear and controversial. In 1534, Jacques Cartier planted a cross in the Gaspé Peninsula and claimed the land in the name of Francis I of France. In 1600, a trading post was established at Tadoussac, but only five of the sixteen settlers survived the winter and returned home that summer. In 1604, the first year round permanent settlement was founded by Samuel de Champlain at Île-Saint-Croix on Baie Française (Bay of Fundy) which was moved to Port-Royal in 1605. In 1608, Samuel de Champlain founded the city of Quebec with 28 men of whom 20 died from lack of food and from scurvy the first winter. British colonization of the Americas (including colonization sponsored by both the Kingdom of England and Kingdom of Scotland before the 1707 Acts of Union which created the Kingdom of Great Britain) began in the late 16th century and reached its peak when colonies had been established throughout the Americas. The Kingdom of Great Britain acquired the French colony of Acadia in 1713 and then Canada, New France. Great Britain also claimed the west coast of North America; indirectly via (from 1804) the North West Company and (after 1821) Hudson's Bay Company licenses west of the Rocky Mountains, the Columbia and New Caledonia fur districts, most of which were jointly claimed by the United States, which called it the Oregon Country, from 1818 until the 49th parallel as the international boundary was extended west of the Rockies by the Oregon Treaty of 1846. The Colony of Vancouver Island, founded in 1849, and the Colony of British Columbia, founded in 1858, were combined in 1866 with the name Colony of British Columbia until joining Confederation in 1871. British Columbia also was expanded with the addition what had been the Colony of the Queen Charlotte Islands and also most of the Stikine Territory, in 1863, and upon joining Confederation with the addition of the Peace River Country, formerly part of the Northwest Territories. Spanish colonizers had originally taken the lead in the Pacific Northwest coast, with the voyages of Juan José Pérez Hernández in 1774 and 1775. This was in response to intelligence that the Russians had begun to explore the Pacific Coast of North America, which the Spanish considered part of New Spain. Santa Cruz de Nuca and Fort San Miguel at Nootka Sound – (1789 to 1795) The first colony in British Columbia and the only Spanish settlement in what is now Canada. In 1799, Tsar Paul I proclaimed Russian title and established the Russian American Company's trade monopoly and rule in the North Pacific through the creation of Russian America. The stated southward limit of Russian claims was 51 degrees north latitude, roughly that of Cape Scott at the northern tip of Vancouver Island. Though no Russian settlements were established in what is now British Columbia, Russian trade and scientific expeditions frequented the North Coast. Intense tripartite negotiation led to treaties between Russia with the US and Britain in 1824 and 1825, respectively, setting the new southward limit of Russian territories at 54 degrees, 40 minutes north latitude, corresponding with Cape Muzon at the southern tip of Dall Island, at the extreme southwest of what is today the Alaska Panhandle. Canada became a semi-independent federated grouping of provinces and a dominion after the Constitution Act of 1867 (formerly called the British North America Act, 1867). Originally three provinces of British North America, New Brunswick, Nova Scotia and the Province of Canada (which would become Ontario and Quebec) united to form the new nation. Full independence came with the Statute of Westminster in 1931 and the Canada Act in 1982. Since 1867, Canada's external borders have changed several times, and had grown from four initial provinces to ten provinces and three territories by 1999. Territorial evolution included the use of Numbered Treaties. Districts of the Northwest Territories – (1882–1905) For much of the Northwest Territories early history it was divided into several districts for ease of administration. District of Ungava – (1895 to 1920) Covered the northern portion of what is today Quebec, the interior of Labrador, and the offshore islands to the west and north of Quebec, which are now part of Nunavut. The Alaska boundary dispute, simmering since the Alaska purchase of 1867, became critical when gold was discovered in the Yukon during the late 1890s and Canada wanted its own Pacific port connected to the gold fields. Canada argued its historic boundary with Russian America included the Lynn Canal and the port of Skagway, both occupied by the U.S., while the U.S. claimed the Atlin District and the lower Stikine and even Whitehorse. The dispute went to arbitration in 1903, with the American claims largely upheld as the British delegate sided with the Americans to preserve the British interest in a close relationship with the U.S.
Otto Sverdrup a Norwegian explorer claimed the Sverdrup Islands for Norway in 1898, but the Norwegian government showed no interest in pursuing the claim until 1928. On 11 November 1930 (Remembrance Day) after formal Canadian intervention, Norway recognized Canada's sovereignty over the islands. 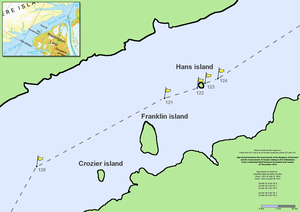 Hans Island is the smallest of three islands located in Kennedy Channel; the others are Franklin Island and Crozier Island. The island is the traditional hunting grounds of the Inuit and is claimed by both Canada and Denmark. In 2007, updates of satellite photos led Canada to recognize the international border as crossing through the middle of Hans Island, not to the east of the island as previously claimed. The Canadian government considers the Northwestern Passages part of Canadian Internal Waters, but the United States and various European countries maintain they are an international strait or transit passage, allowing free and unencumbered passage. Although Canada and the United States share the longest non-militarized border between two countries, there is a long history of disputes about the border's demarcation. Since Confederation in 1867, there have been several proposals for new Canadian provinces and territories. The Constitution of Canada requires an amendment for the creation of a new province but the creation of a new territory requires only an act of Parliament; therefore, it is easier legislatively to create a territory than a province. ^ "French Colonies". Ashley Araiza, Cevera Clark, & Donielle Wolfe. Harlingen School District. 2009. Retrieved 22 June 2010. ^ "List of Former British Dominions Colonies, Protectorates Protected and Associated States Mandated and Trust Territories". Flags of the World. 2009. Retrieved 22 June 2010. ^ "Scots". The Canadian Encyclopedia. 2008. Retrieved 22 June 2010. 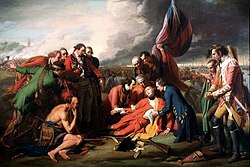 ^ "The Seven Years' War in Canada". The Quebec History Encyclopedia (Marianopolis College). 2005. Retrieved 12 September 2010. ^ "Canadian Confederation". Library and Archives Canada. 2005. Retrieved 12 September 2010. ^ a b c d "Territorial Evolution, 1867 to 1999". Natural Resources Canada. 2010. Retrieved 12 April 2010. ^ William C. Sturtevant (1978). Handbook of North American Indians. Government Printing Office. pp. 1–. GGKEY:0GTLW81WTLJ. ^ The allied tribes occupied the territory which the French named Acadia. The tribes ranged from present-day northern and eastern New England in the United States to the Maritime Provinces of Canada. At the time of contact with the French (late 16th century), they were expanding from their maritime base westward along the Gaspé Peninsula/St. Lawrence River at the expense of Iroquoian-speaking tribes. The Míkmaq name for this peninsula was Kespek (meaning "last-acquired"). ^ "Wabanaki". Wabanaki. 2014. Retrieved 28 February 2014. ^ "Background 1: Ojibwa history". Department of Science and Technology Studies · The Center for Cultural Design. 2003. Retrieved 15 April 2010. ^ Johansen, Bruce (1995). "Dating the Iroquois Confederacy". Akwesasne Notes New Series. 1 (3): 62–63. Retrieved 16 August 2010. ^ Bruce Elliott Johansen; Mann, Barbara A. (2000). Encyclopedia of the Haudenosaunee (Iroquois Confederacy. Greenwood Publishing Group. p. 14. ISBN 978-0-313-30880-2. ^ Trigger, Bruce G (1987). The children of Aataentsic: a history of the Huron People to 1660. McGill-Queen's University Press. p. 156. ISBN 0-7735-0626-8. Retrieved 11 August 2010. ^ Proceedings of the Canadian Institute, Toronto, Being a Continuation of "The Canadian Journal of Science, Literature and History.". Canadian Institute (1849–1914). 1887. p. 1. ^ "Blackfoot (people) - Encyclopædia Britannica". Britannica.com. Retrieved 28 February 2014. ^ Bobbie Kalman (2007). A Visual Dictionary of Native Communities. Crabtree Publishing Company. p. 26. ISBN 978-0-7787-3505-2. ^ Magnus Magnusson; Hermann Palsson (1965). Graenlendinga saga. Penguin Books Limited. p. 28. ISBN 978-0-14-044154-3. ^ "Vikings: The North Atlantic Saga". National Museum of Natural History, Arctic Studies Center- (Smithsonian Institution). 2008. Retrieved 11 August 2010. ^ Linda S. Cordell; Kent Lightfoot; Francis McManamon; George Milner (2008). Archaeology in America: An Encyclopedia: An Encyclopedia. ABC-CLIO. pp. 82–. ISBN 978-0-313-02189-3. ^ Prowse D. W. (Daniel Woodley) (2009). The Discovery of Newfoundland by John Cabot in 1497. BiblioLife. p. 3. ISBN 978-1-113-54841-2. ^ Bailey Bailey Wallys Diffie (1977). Foundations of the Portuguese Empire: 1415 - 1580. U of Minnesota Press. p. 464. ISBN 978-0-8166-0782-2. ^ a b "The Portuguese Explorers". Memorial University of Newfoundland. 2004. Retrieved 27 June 2010. ^ Bill Rompkey (2005). Story of Labrador. McGill-Queen's Press - MQUP. p. 20. ISBN 978-0-7735-7121-1. ^ a b Roger E. Riendeau (2007). A Brief History of Canada. Infobase Publishing. p. 36. ISBN 978-1-4381-0822-3. ^ a b James D. Kornwolf (2002). Architecture and Town Planning in Colonial North America. Johns Hopkins University Press. p. 14. ISBN 978-0-8018-5986-1. ^ Ruben C. Bellan (2003). Canada's Cities: A History. Whitefield Press. p. 2. ISBN 978-0-9699686-1-0. ^ André Magord (2009). The Quest for Autonomy in Acadia. Peter Lang. p. 31. ISBN 978-90-5201-476-0. ^ Allan Greer (1997). The People of New France. University of Toronto Press. p. 5. ISBN 978-0-8020-7816-2. ^ a b c d "Territorial Evolution of Canada, 1667 to 1873". Natural Resources Canada. 2010. Retrieved 12 April 2010. ^ Jean Barman (1996). The West beyond the West: a history of British Columbia. University of Toronto Press. pp. 20–26. ISBN 978-0-8020-7185-9. ^ María Luisa Rodríguez-Sala (2006). De San Blas hasta la Alta California: los viajes y diarios de Juan Joseph Pérez Hernández. UNAM. p. 35. ISBN 978-970-32-3474-5. ^ John Eric Vining (2010). The Trans-Appalachian Wars, 1790-1818: Pathways to America's First Empire. Trafford Publishing. p. 143. ISBN 978-1-4269-7964-4. ^ A. Aleksei I. Miller; Alfred J. Reiber (2004). Imperial rule. Central European University Press. pp. 161–164. ISBN 978-963-9241-98-5. ^ "British North America circa 1823". Natural Resources Canada. Retrieved 11 December 2010. ^ Robert Greenhow; United States. Dept. of State; United States. Congress. Senate. Select Committee on the Oregon Territory (1840). Memoir, historical and political, on the northwest coast of North America, and the adjacent territories: illustrated by a map and a geographical view of those countries. Blair and Rives, printers. p. 189. ^ "The Plans for Russian Expansion in the New World and the North Pacific in the Eighteenth and Nineteenth Centuries". The European Association for American Studies. 2010. p. s-20. Retrieved 11 December 2010. ^ Carl Waldman; Molly Braun (2009). Atlas of the North American Indian. Infobase Publishing. p. 234. ISBN 978-1-4381-2671-5. ^ Atlas of Canada. "Territorial evolution". ^ a b D.M.L. FARR (2009). "Alaska Boundary Dispute". The Canadian Encyclopedia. Retrieved 11 April 2010. ^ Haglund, David G; Onea, Tudor (2008). Victory without Triumph: Theodore Roosevelt, Honour, and the Alaska Panhandle Boundary Dispute. 19. Diplomacy and Statecraft. pp. 20–41. doi:10.1080/09592290801913692. ^ William J. Mills (2003). Exploring Polar Frontiers: A Historical Encyclopedia. ABC-CLIO. p. 129. ISBN 978-1-57607-422-0. ^ Pierre Berton (2001). The Arctic Grail: The Quest for the North West Passage and the North Pole, 1818-1909. Doubleday Canada. p. 629. ISBN 978-0-385-65845-4. ^ a b Rongxing Guo (2006). Territorial Disputes and Resource Management: A Global Handbook. Nova Publishers. p. 134. ISBN 978-1-60021-445-5. ^ "Arctic Sovereignty Policy Review" (PDF). Carleton University School of Journalism & Communication. 2011. Retrieved 1 January 2012. ^ Carnaghan, Matthew; Goody, Allison (2006). "Canadian Arctic Sovereignty". Library of Parliament (Political and Social Affairs Division). Retrieved 11 December 2010. ^ Donald Malcolm McRae; Gordon Ross Munro (1989). Canadian Oceans Policy : National Strategies and the New Law of the Sea. UBC Press. p. 50. ISBN 978-0-7748-0346-5. ^ "Amendment by general procedure". Constitution Act, 1982. Department of Justice, Government of Canada. Retrieved 17 March 2010. An amendment to the Constitution of Canada in relation to the following matters may be made only in accordance with subsection 38(1)...notwithstanding any other law or practice, the establishment of new provinces. ^ Norman L. Nicholson (1979). The boundaries of the Canadian Confederation. McGill-Queen's Press – MQUP. pp. 174–175. ISBN 978-0-7705-1742-7. Derek Hayes (2006). Historical Atlas of Canada: Canada's History Illustrated with Original Maps. Douglas & McIntyre. ISBN 978-1-55365-077-5. R. Cole Harris; Geoffrey J. Matthews (1987). Historical Atlas of Canada: From the beginning to 1800. University of Toronto Press. ISBN 978-0-8020-2495-4. Wikimedia Commons has media related to Maps of the history of Canada. This page was last edited on 31 March 2019, at 16:47 (UTC).